If you have ever seen a wellness professional, you probably have experience with some variation of the Wheel of Wellness, or Wheel of Life, exercise. Though I know similar personal development exercises have crossed my path at various times in my life, it was not until I began my graduate studies, in health and wellness coaching, that I was more thoroughly introduced to this tool as a means of individual assessment of overall wellness. Even in my lifetime, I have felt our cultural awareness of the mind-body connection evolve, at least somewhat. The Wheel of Wellness seems to illustrate this greater awareness. 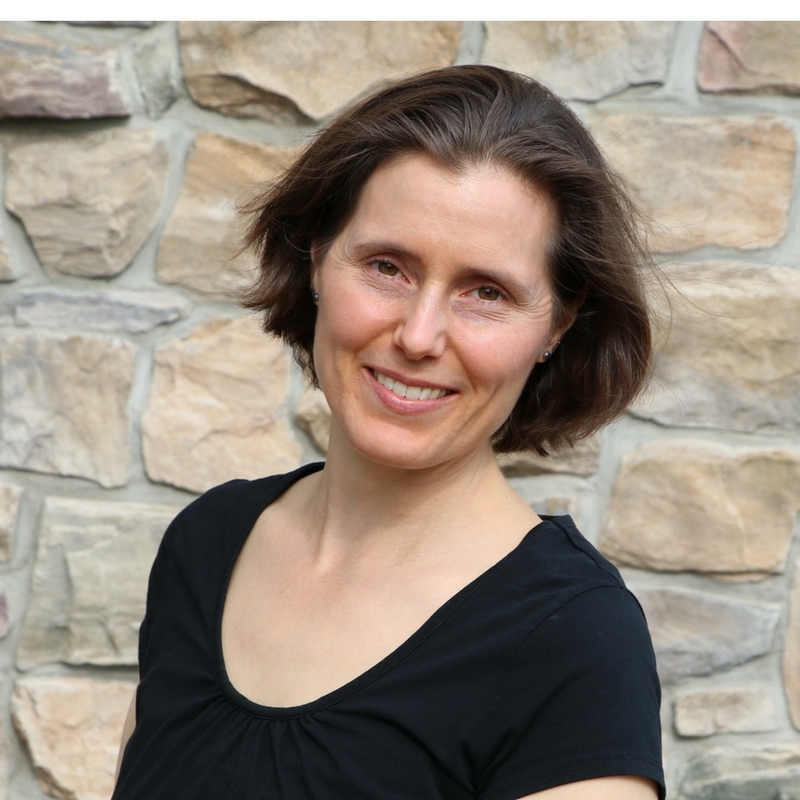 I will share some reflections of the insights it has prompted for me, both as a coach and a health-seeker, and how the Wheel of Wellness can help create a balanced life for you. As a teenager, in the late 1980’s, before the Internet took hold, I remember spending hours in my room, immersed in a huge Mayo Clinic book, scanning through the symptoms of a myriad of diseases, trying to find a solution to my chronic severe acne and rather rapid weight gain. Never having been given the framework of “wellness,” I felt there had to be an external fix that I had not found yet! Thankfully, in the subsequent decade, or two, my evolution seems to have followed the cultural trend. My awareness of holistic health and wellness expanded, prompting some “inner work,” and shifts in my lifestyle that improved my unwanted symptoms and quality of life. Thus, if you find yourself identifying with a symptom (ie. like having acne, being overweight, anxiety or experiencing physical pain), the Wheel of Wellness might help you zoom out your lens and begin to see the interdependent parts of your life that manifest in those symptoms. This can give you more information about which resources you need to recalibrate the imbalances in your life. It is a visual tool to prompt new awareness to challenges you may not be able to articulate, otherwise. The theoretical model of the Wheel of Wellness was developed in the 1990’s, as a result of actual research in the field of individual psychology, from which some characteristics emerged that correlated positively with health, quality of life, and longevity (Myers & Sweeney, 2004). However, despite its academic origins, from a creative standpoint, its components feel rather intuitive to anyone who takes the time to pause and reflect on the areas of their life that contribute to them feeling “whole” and balanced. Accordingly, you can find varying perspectives on this original model all over the Internet. And, while it definitely will behoove the wellness professional, or even avid personal development enthusiast, to understand the psychological underpinnings of the Wheel of Wellness activity, you do not need a degree or a professional to facilitate your understanding of this exercise. All you need is a willingness to reflect honestly on your life and an openness to change. The Wheel of Wellness provides a snapshot, or big picture view, of your current sense of balance, not a historical overview or road map to the future. As such, it is an excellent tool for creating awareness of where you are in the moment. Then, you can reflect on how you got there, and where you want to be. Physical – representing our physical body, need for movement, nutrition and rest. Emotional – representing our psychological well-being, our ability to manage the challenges of life and feel fulfillment. Intellectual – refers to our creative outlets, ability to take on challenges that expand our knowledge and skills. Social – referring to our sense of belonging, connection and support within our relationship circles. Occupational – this refers to the sense of fulfillment one gets from their work. Financial – refers to our degree of contentment with our financial resources, which impact our sense of security. Spiritual – this can refer to the individual’s greater sense of connectedness in the world, or the ability to feel purposeful and attribute meaning to life in the big picture. Whereas, if you feel overwhelmed in your day to day life, unable to specifically pinpoint the source of this overwhelm, creating a Wheel of Wellness with more narrowly defined sections in each of the primary domains might help you gain some clarity as to where you need to direct your energy to achieve a better sense of balance. For example, for the physical domain, you could break that down into nutrition, movement and sleep. There are no steadfast rules for this activity, but it is good to remember the mind-body-spirit paradigm, in relationship to the external world (environment & relationships), when brainstorming the parts of your wheel. Once you decide on how to divide the parts of your wheel into the representative parts of your life, then, you score each part on a scale of 0 to 10, with zero being the center of the circle, and 10 being the border of the circle. 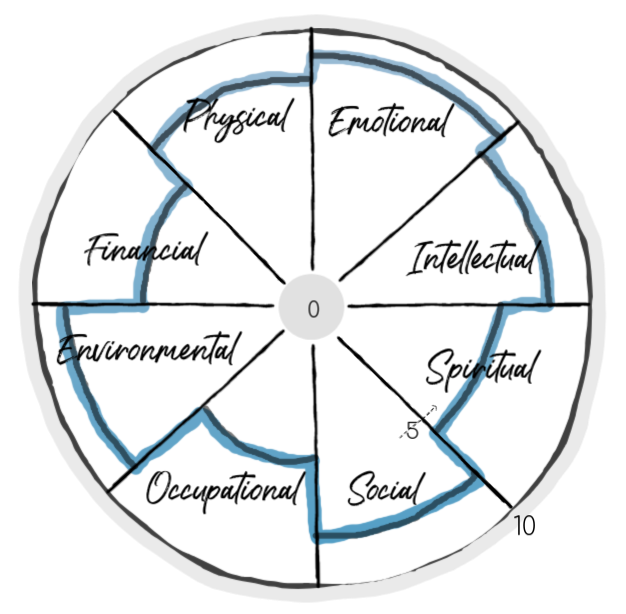 However you categorize the elements of your life, you should begin to get a big picture view of where your imbalances are on your Wheel of Wellness. And, there will likely always be some! Even though I have training as a wellness coach, I do not have a magic wand or secret formula for balance in my own life, either. Though the skills I have gained definitely help the process, there is always room for growth. For example, I feel particularly strong with my nutrition, emotional well-being and intellectual fulfillment. My social life and relationships are good, but definitely impacted by energy and time restraints. The same could probably be said for my “spiritual life,” or connection with nature, because I feel like it is hard to prioritize getting outside as much as I would like these days. Sleep has always been my nemesis, and probably ranks around a 7 on a scale of 1 to 10. And, my relationship to money will likely always be a work in progress, though I am thankful for the abundance in my life. 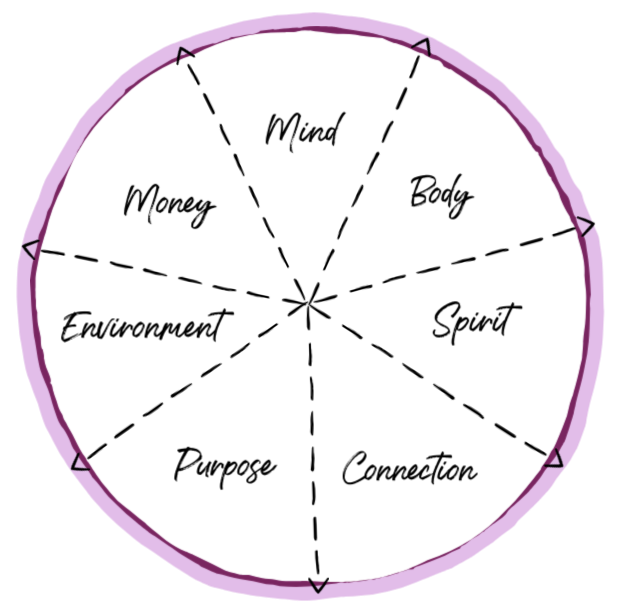 Does the shape of your Wheel of Wellness mirror the outer circle, or does the shape look more imbalanced? From this perspective, you can see, by using the Wheel of Wellness exercise to examine our lives, we get a broader view of the parts of our “whole” self and how we can better nurture those parts. And, there is no better way to begin to nurture your whole self than to open the conversation; to reflect on where you are in the moment and where you want to be, allowing space for support from others. When working with a health and wellness professional, the Wheel of Wellness is meant to be a tool to facilitate discussion and help provide the client with greater awareness. But, the same can be true when doing the exercise on your own. Once you begin to highlight the areas where you feel the most challenged, you can use the exercise to open dialogue with friends and family who may provide valuable support, or, to seek out further resources. You might even find the Wheel of Wellness exercise to be a fun activity to do with family members, good friends or a support group. It will provide a wealth of rich conversation, offering the opportunity to share feelings, offer support and reflect on the topic of what constitutes a balanced life. Accordingly, the Wheel of Wellness exercise will, most certainly, begin to provide you greater awareness of where your strengths and weaknesses lie, and how you can use your strengths to your advantage. For example, maybe your biggest wellness challenge is your physical body. You certainly would not be alone. Many people find themselves overweight, inactive or struggling with illness, and this is what prompts them to examine their lifestyle, bringing greater awareness of how other areas of life influence, or are influenced by, the state the physical body. Back in 2004, I could not ignore that my physical self was one of the biggest struggles. It was impacting my emotional health, and other areas of life, as well. I was concerned about my health and wanted to be an active parent and good role-model for my, then, young children. Adopting a holistic approach to weight loss allowed me to move away from the restrictive yo-yo dieting pattern I had been in for a long time, overhaul my nutrition, mindfulness and movement practices, and feel more balanced in the “physical” realm of my current Wheel of Wellness. Even without the image of the specific Wheel of Wellness exercise, at that time, simply thinking of myself as a whole person, and not just the symptom of being overweight, shifted my focus to wellness, rather than just weight loss. This extra weight, or “spare tire,” that I carried for so long, evolved into a symbol for me. We carry a spare tire in our car for protection, in case we break down. But, we all know what the expression of “being a fifth wheel” means, too. It is something or someone not necessary. My extra weight was not necessary, but it provided me security on my journey up to that point. But, then I broke down and needed to use the spare tire up, and had to let the security of that fifth wheel go to allow the possibility of moving in the right direction. Also, by visualizing the most notable areas of imbalance on your Wheel of Wellness, you can begin to make note of all the positive in your life; areas where you excel. Maybe you have a great social life, fulfilling career, balanced finances, and strong emotional health, but you just have not translated that success in other areas of life to your physical health. This exercise can help you tap into your strengths and gain clarity about the steps you need to take to facilitate change. Of course, this prospect of change, no doubt, will impact your emotional well-being, to some degree. And, round and round we go, always striving to move towards balance. This is what wellness is; a process, not a final result. Sleep is an area, for me, where this wellness process is most evident. And, for many of us, it is an area we overlook with regards to our whole health. I found it ironic that, during the time when I was learning how to use the Wheel of Wellness exercise with potential clients, my own sense of wellness was thrown off balance quite a bit. The stress of trying to manage the studying and research needed for my degree, while fully immersed in family life with three kids, impacted my sleep and exercise routines significantly. However, taking holistic perspective allowed me to view the temporary imbalance in my Wheel of Wellness, as a part of tending to in other areas of my life, with the overall intention being to bring everything back into balance in the long-run. 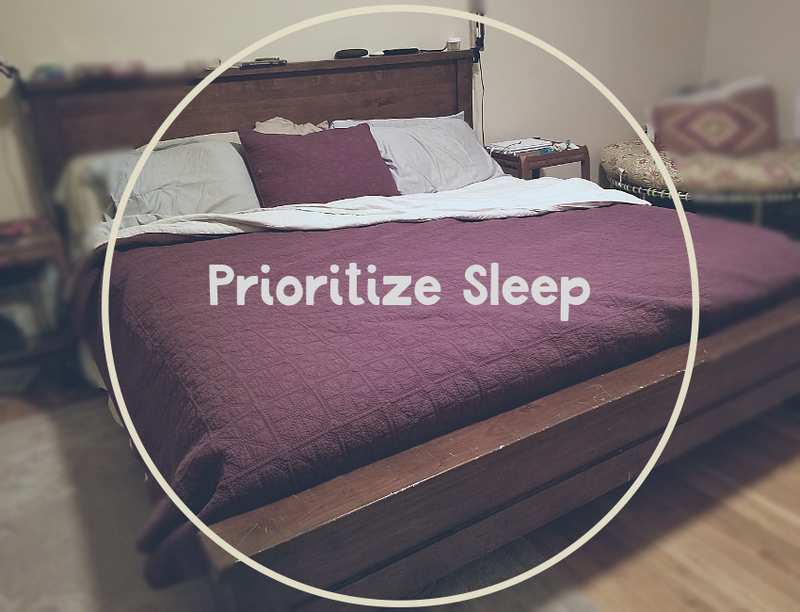 Even so, though I relied on my strengths of organization and time management during my studies, the experience, coupled with an earlier life circumstance of chronic sleep-deprivation with a sick infant, I am always reminded to be patient with myself when I am tired, but to prioritize good sleep, as much as possible. Without adequate rest, we will not have the energy to strive towards balance in other areas of our lives. The Wheel of Wellness can give you a starting point for change, and the sense of engaging in the process taking the best care of yourself possible. While we may not always “be in balance,” the intention to continue the work necessary to move in that direction can provide the emotional benefit of feeling purposeful and proactive, even in the face of life challenges. One example of a life challenge could be finances. Money, in my life, always seems to ebb and flow, rarely finding my preferred balance. I have learned to ride this wave with relative skill, but am always working toward growth in this area. Many people struggle with their sense of financial security. There is no shame in this, though it does not feel good to be too out of balance in this area for prolonged periods of time. Our degree of financial security often correlates strongly to our emotional well-being. Because we often view money as something subject to chance and impacted by external, arbitrary forces, it can leave us feeling somewhat powerless to facilitate change. While it is true that there are many external forces that can influence our security, being financially secure is rarely just the luck of the draw. There are many actionable and practical things we can do to feel proactive and increase our sense of security and abundance. We can control the purchases we make, the energy we expend in exchange for money, the things to which we attribute value, and the support system we create to affirm our values. Using the Wheel of Wellness to assess our priorities and take action can definitely make us feel more proactive with regards to creating change in this area of our lives. Another aspect of the Wheel of Wellness that can be useful, is to make it an art-driven process, including color, symbols and metaphor. This could result in a piece of functional art we use as a reference when we need a reminder to stay on track with our health and wellness goals. Or, for those preferring the clarity of simple lines, it might become more of a statistical analysis, charting the elements of your life for assessment to keep in notebook for frequent reference. Either approach is great. It is your life. So creating a visual tool to help you get an overview of the areas to which you want to shift your attention, is useful, however simple or elaborate you wish to make it. I love the symbolism of the “wheel.” Its circular shape is reflective of the circle of life, containing all the elements that create our experience, and depending on your philosophical views, just keeps circling around, offering new awareness. It could represent the Universe, containing our unlimited potential, or, our World, constantly working to keep our environment in balance. Also, much like the Wheel of the Year, with its seasons and corresponding festivals, our sense of wellness will often shift with the seasons of the year, as well as, the seasons of life. But, there is always something to be celebrated. If you wanted to take a more psychic or mystical approach, one could even use the Wheel of Wellness to correspond with our “aura” and the energy flowing through the seven chakras, each represented by a color and corresponding to specific areas of the body, emotions and spiritual components. Examining blocks in this flow of energy could help us move towards balance between the mind, body and spirit. Just like the domains of our lives, the seven major chakras within the body are interconnected, with the top three representing the spiritual, and the lower three representing the physical, connected in the center by the heart chakra (Alcantara, 2017). 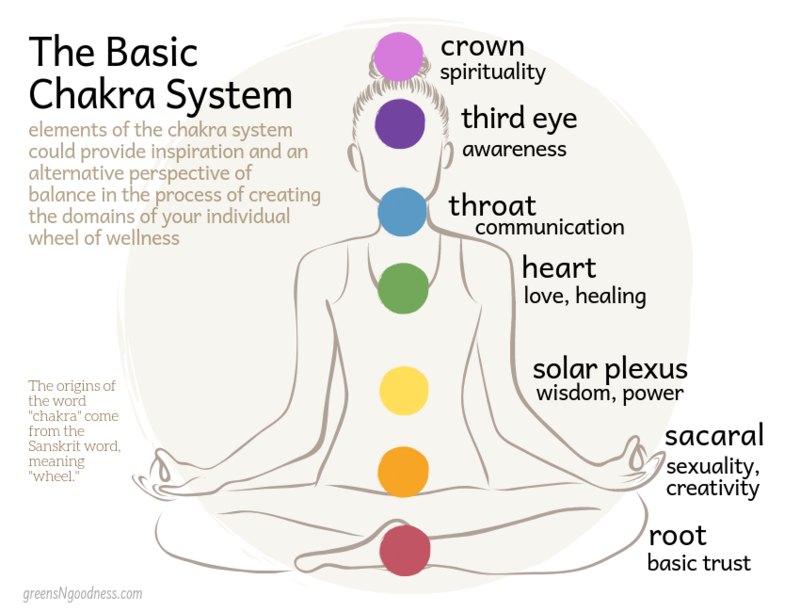 So, we can see how one could incorporate elements of the chakra system into the Wheel of Wellness activity, as a creative alternative. In fact, the origins of the word “chakra” come from the Sanskrit word, meaning “wheel” (Alcantara, 2017). What better symbolism to provide inspiration for seeking balance? Another creative, or symbolic, way to look at a Wheel of Wellness exercise would be to reference the traditional Native American Medicine Wheel, which itself is a tool for healing. As Ralph P. Brown (2014) notes, the Native Americans believe that illness is related to more than the physical body, but stems from imbalances, including the physical, as well as, mental, emotional and spiritual. He outlines the basic directions of the medicine wheel, each corresponding to one of the “bodies,” to include North/Mental, East/Physical, South/Emotional and West/Spiritual. The wheel exists within the environment of Father Sky/Above/Occupation and Mother Earth/Below/Social. This, essentially, outlines the dimensions of life, like the Wheel of Wellness, that encompass our sense of balance. So, you can see, the parameters of the wheel are subject to individual interpretation, and the “parts of the whole,” can be symbolized by whatever aligns with your own vision for your life and your sense of well-being. For many, symbolism and stories provide deep meaning and a sense of purpose moving towards balance. For others, more definitive descriptions of the domains on the Wheel of Wellness will be helpful. Simply visualizing the domains of your life can make you more aware of the ways in which you can nurture yourself more fully to improve the quality of each area. As such, the Wheel of Wellness serves to promote self-care and helps us to begin to define, and gain clarity about, the areas we may have been neglecting, as well as, what “self-care” really looks like to us in the context our our current lives. The actions we need to take to improve the state of our physical body, for example, though often challenging, can seem easier to articulate; eat real whole foods in reasonable quantities, move daily, rest when needed. Simple enough. Right? But, when we begin think about self-care in other areas of our lives, it can be easy to draw a blank. Where to start? More time with friends? More time alone? Work on my spiritual life? Connect to my community? Find more fulfilling work? It can feel overwhelming. 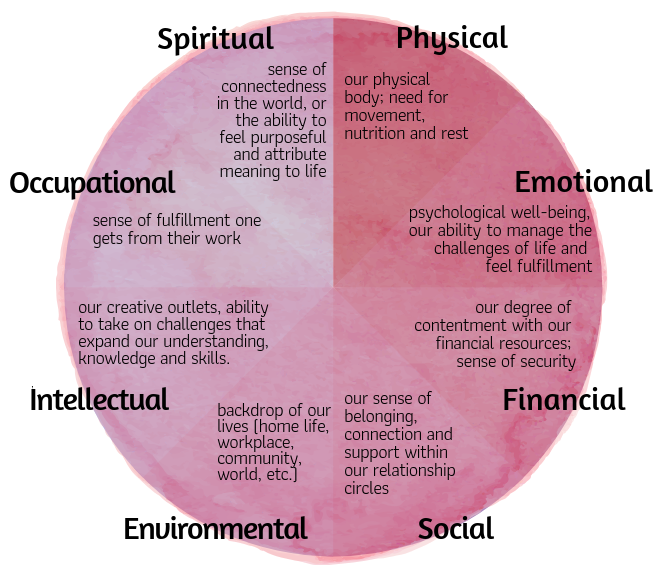 This is where the Wheel of Wellness can help us narrow our focus and begin to define the areas of priority for us. For example, you may have been feeling a yearning for deeper connection, whether it be with humanity, nature, God, the Universe, etc. But, working on our “spiritual life” can sound abstract and intangible. What does “being spiritual” even mean? Well, essentially, it refers to a sense of connection beyond just ourselves and the meaning we derive from, or attribute to, our universal human experience. So, when we examine the “spiritual” domain of our Wheel of Wellness, we can start to dissect what that really means for us. Considering this meaning, we can begin to ask ourselves questions. From where do I derive a sense of connection to something greater than myself? Where or when do I feel a deeper sense of meaning in my life? In nature? In community? In the creative process? Ok. Good. Let me go find ways to do more of the things that help me connect to that feeling. What are those things? Well, let’s see… hiking, camping, taking a walk, just taking a time out to sit in my backyard and watch the birds, making time to write, draw, do art, attend community events for yoga and meditation, go to church, start a spiritual support group… keep brainstorming! Now we have a list of some definitive things we can do to move towards balance in this area! 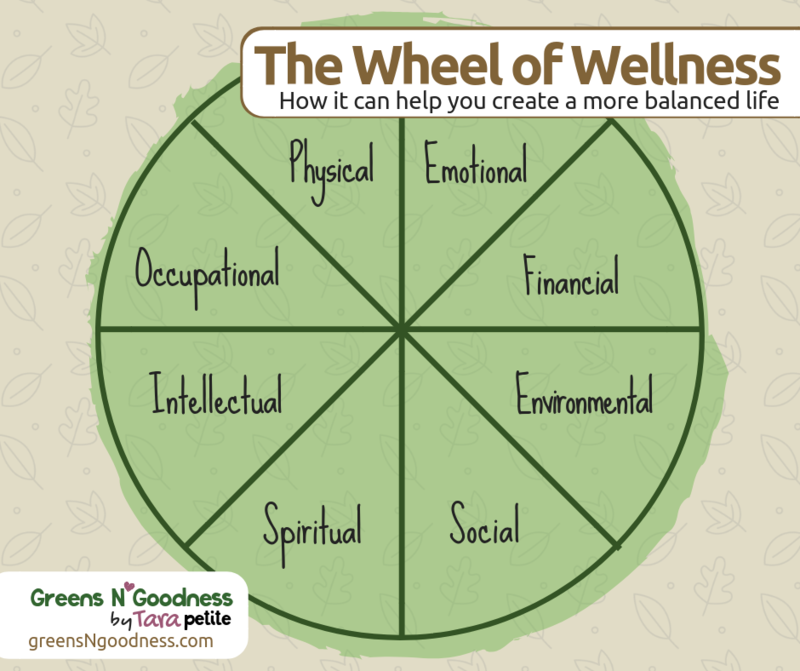 And, through creating this greater awareness, we begin to see how the Wheel of Wellness can help create a balanced life. This same process that we could use to examine our spiritual life and brainstorm actionable steps to improve that domain of our Wheel of Wellness, works the same in the other areas on the wheel, including our emotional well-being, intellectual pursuits, social connections, our greater environment and occupational fulfillment. We can work our way around the wheel, examining our feelings, priorities, fears, challenges and joys. It can help us explore our lives more deeply, bring more self-awareness, and enrich the process of being human. It only requires honesty and patience from yourself and a strong willingness to nurture your whole self to the best of your ability. So, whether you are an avid personal development junkie, or just someone struggling to feel whole and balanced in this hectic world, consider the Wheel of Wellness exercise as a catalyst for change and the opportunity to take an alternative perspective of the feelings that may currently be presenting a roadblock to your growth. If you stick with the process, remind yourself of its value, elicit support where you can, and get creative, you will likely enjoy your journey around the the wheel! Be well! ***This colorful and detailed wellness diary, in PDF form, offers a useful wellness wheel exercise, based on the Native American view of wellness.